Let's face it, Hennessy is more known amongst the ladies as the drink that will put hair on your chest. It's commonly tossed back on the rocks, blended with Hypnotiq (do people still drink that?) for an Incredible Hulk, or for blended with coke. 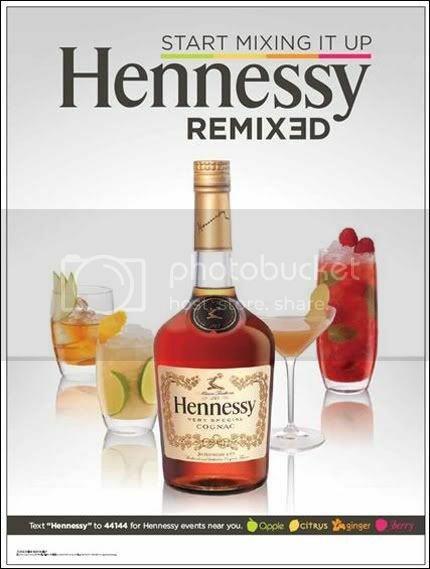 However, there are new more chic variations of Hennessy based drinks that even the most sophisticated party people will enjoy without feeling like they should swig it from the bottle stuffed inside a paper bag. This is why the brand enlisted the help of Tocarra and master mixologist Jordan Bushell to help remix the brand for the social butterfly who likes to entertain-- just in time for Memorial Weekend, the official kick off of cookout season. "What we’re doing is touring the country and we’re just showing our Hennessy family and friends--the people that love Hennessy that Hennessy is mixable. We can take the VS and pair it with four different flavors for Hennessy apple, berry, ginger and citrus," Tocarra tells VIBE. " And even I like it, which means I can introduce it to ladies." "We came up with these four flavors is because we really feel they show off different aspects of Hennessy and if you maybe don’t know about Hennessy we can show off newness but if you already drink Henness then you’re already gonna know what you like about it and whatever you like is already gonna be duplicated within these flavors," Jordan Bushell tells VIBE. "So they’re not trying to hide Hennssy, they’re trying to amplify and pair well the flavors that are already in there it’s gonna bring you a different feel." Pour Hennessy into highball, add cubed ice (fill the glass), top with good quality cloudy apple juice. Garnish with freshly sliced apple. This drink pairs well with meat dishes that involve turkey, beef and pork. Pour Hennessy into highball, add lime juice and cubed ice (fill the glass), 1/2 fill glass with cola, stir gently, add more cola and garnish with a Lime wedge. Pour Hennessy into highball, add cubed ice (fill the glass), top with Cranberry juice. Garnish with a Lime wedge. You can also add apple juice for a twist. Pour Hennessy into highball, add cubed ice (fill the glass), top with Ginger ale. Garnish with a Lime wedge. If you have a good idea of what types of flavors might pair well with Hennessy VS then feel free to get your mix master on and tweet us the results @VIBEMagazine. Be safe and have a great Memorial Day Weekend.